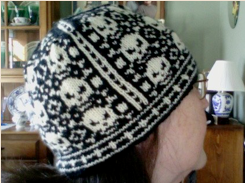 Yes, my “We Call Them Pirates” hat is completed, washed, and blocked, and I wear it nearly every day. It fits perfectly and it keeps my head nice and warm. I used Dale of Norway Falk, which is a superwash wool that is nice for things like hats and mittens.